GNLU Gandhinagar trumped NUJS Kolkata to win the ninth edition of India’s oldest tax moot - the Nani Palkhivala Memorial - on Saturday. 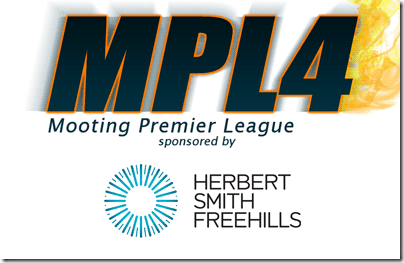 The Tier 4 win, on GLC Mumbai turf, earned GNLU 15 points picking it up eight places in the standings in the MPL 4, sponsored by Herbert Smith. The college now sits at number six, three places below the now third-ranking NUJS. Jindal Global Law School (JGLS) Sonipat won the award for best memorial, while HNLU Raipur’s Shobhit Koshta picked up the best researcher prize. Jamia Milia Islamia Delhi’s Shafaq was declared the best speaker. Jamia is now in second place of the MPL, ahead of NUJS Kolkata and JGLS. Prateek Kumar, Aditi Tambi and Ishita Farsaiya from the winning GNLU team also bagged an internship with Nishith Desai Associates. Researcher Farsaiya was all praises for GLC’s “superb” hosting of the event in terms of accommodation, mooting venue and the food served. “Whether we win or lose, the way these people have treated us, we’ve had one hell of a time,” she said. Second-placed NUJS was represented by Dhvani Shah, Puneeth Ganapathy and Nihal Joseph. The other awards distributed include the prize for the second best speaker for which ULC Bangalore’s A Mahesh Chowdhary and Bangalore Institute of Legal studies’ speaker Pranjit Bhattacharya were tied, and the Nani Palkhivala Memorial Research Paper Competition from last year’s edition of the moot which was taken away by RGNUL Patiala’s Arnab Naskar and Shubhangi Gupta. 26 teams including previous MPL seasons’ goliaths and recent Manfred Lachs world rounds winners NLSIU Bangalore participated in the competition. NLSIU had clinched victory at the moot last year. We are still evaluating suitability of the Amity Noida moot, as well as confirming results for the Surana Trial North-East rounds. Amity International moot should be included in MPL4!!! Being new is not a criteria but competitive is. Even Surana North East moot is new and AICLM by NLU Delhi was there since inception. Legally India, why are you people still evaluating the suitability of Amity International Moot when you are considering the results of Surrana Trial North-East. Isn't the participation of most NLUs and more than 25 law schools with phenomenal judging a criteria enough to include the moot in MPL 4. Just because Amity is not a National Law School, these double standards exist. If at all there is any fairness, you would include Amity International Moot in this season's MPL. Surrana Trial Advocacy remains by far one of the least participated moots. Dear Amity Noida moot supporters, please stop spamming the same messages over and over in any MPL comments, it won't make inclusion any more likely. We'll have to evaluate Amity Noida's suitability since it is new, NLS, NLIU and NLU-J don't seem to have participated, for example. We'll also have to try and confirm the standards. It is definitely a strong candidate for inclusion next year, although possibly also for this time. Surana Trial North-East, I agree with you, and we are considering ditching the Surana trial regional selection rounds completely, since they've been divided into 3 this year, meaning each win should count for less. Unfortunately, we have already allotted points for Surana North, so we're in a bit of a pickle. In the interest of fairness, we may have to give points to Surana North East this time, begrudgingly. We're still looking into and will try to come up with a good solution. Do let us know feedback on those choices below (but please don't keep repeating the same Amity Noida soundbites). What is usually the criteria for including moots in the MPL. I know that there seems to be a lot of public support for the inclusion of Amity International Moot. Congratulations Guys!!!!!! You have made us proud!! Palkhivala moot is a technical one (obviously, its tax law!) and is judged by sitting members of the ITAT. Substance was always more important than style at this moot. When judging a moot, senior lawyers and judges sometimes tend to ignore the fact that there are marks for style as well and allow impressive technical arguments to affect their marking of the style section. The reverse is generally seen more frequently (at least in the preliminary rounds) i.e. stylish speakers are able to positively affect the marking of the substance section with their style. The best speakers are able to display both - its not like some lawschools rely on style alone. The fact is that style is crucial in mooting (technical knowledge is assumed for finalist teams). Congrats to the team. But what a silly headline!!! In every moot, it is always the quality of arguments that matters the most. Of course, one has to speak English correctly, but thats about it. At the Jessup, there are teams from non English speaking countries that do fairly well. There English may be heavily accented and not have the same "flair" as Indian National Law School students, but they still win. So there is no such "myth" to be shattered - perhaps the myth is for people who have never mooted and for giving eye catching headlines. Amity International Moot should be there in MPL 4. If Surana North East can be there which is not even a year old, then Amity moot must be there. AICLM by NLUD is there in MPL right from its 1st edition. Comeptition must be the criteria and not how old the moot is. Amity International must be there in MPL4! Kian its entirely your discretion but seeing the level of competition and judging standards, we feel you should include it in Tier 4. Being new should not be the criteria, it has been 2 years for us to conduct the moot. Also, Corp Law moot was there in MPL from season 1, so that should not be the criteria to judge the moot. Just one or two big names were missing and the colleges doing well this year in MPL, all were there in the moot. We had Sr. Advs. like Pinky Anand judging the prelims. For Surana North East, we won't comment. Its upto you. Thanks for pointing out - the 4 points were there, just not the text in the description. Kian RGNUL was semifinalist in tax as well NLU Delhi Corp. Moot but only 4 points are added. Sawhney and NLU D are tier 5, where runner-up and semi-finals respectively are 5 points and 3 points, so the existing scores are accurate in the table, I think. thanks a lot.. It was my mistake..
To Legally India, Indian law's first. A limerick in honour of Kian & co. Just a fan impressed by his manner of catering to all readers, law students or Kishen, whoever he is, despite what seems like unrelenting criticism. I might not currently be at my soberest best but hats off and may you have a thousand sons. And cheers, have a great evening! Just to add a point for Amity International Moot, so far as NLIU Bhopal is concerned, it was there AIM's 1st edition, however it was missing this time. One or two biggies playing a truant should hardly matter as it is generally seen with the present Tier 5 moots in MPL. An area such as Tax is indeed very technical. GNLU teams can be very meticulous with the concepts but unfortunately things go wrong many a times when it comes to intra moots where people are selected. Good mooters but bad teams spoil the cake. MCC needs to delve into the issue seriously. I think there's only a minor typo in the text. The points are all still in order. Participated in Nani Palkhivala year before last, GLC Mumbai is undoubtedly, unequivocally, and undisputedly the best host college for a few years now, be it Nani Palkhivala or DM Harish. Kudos to GNLU! "GLC Mumbai is undoubtedly, unequivocally, and undisputedly the best host college for a few years now, be it Nani Palkhivala or DM Harish." Completely agree. They have the budget, the warmth and the thoughtfulness. I went for both moots and they were fab hosts. 100 cheers to GLC! Kain, you have no set criteria. I see ICC Mediation on MPL4, how does a Mediation even remotely become a moot ? NLIU might have had exams, etc. coz they usually do participate at Amity Moots. Well done GNLU; tax laws have tremendous opportunities and this is a really great achievement. Manish Kanth must be really proud. We'd like to issue a clarification. GNLU’s researcher Ishita Farsaiya's quote has been amended to replace “NLS [Bangalore]” with “national law schools”, after a miscommunication on this point. The point which Farsaiya was making was that non-national law schools often attribute national law university mooting wins to the students’ brilliant oration, but this competition shattered her *own* belief that a great speaking-style without good argument-content can get one very far in moots. We regret any misunderstanding or offence caused. Out of the current top 5 teams in MPL4, 4 were there in Amity moot barring NLS. Onw or two biggies playing a truant should not matter. A moot should be construed in whole, including judging and level of competition. Amity should be there in MPL4. any idea what happened at the regional rounds of henry dunant? nlu, delhi went there? They won, they move to Hong Kong. goooooooooooo gnlu!!!! why only 26 teams this time in palkhivala whereas other editions have had many more teams? There have always been 26 teams in Nani Palkhivala, on account of there being 13 courtrooms at the Income Tax Appellate Tribunal. It's an invitation only moot.